For starters, if you think about it wedding veils pull your entire wedding look together. Not only do they compliment your hairstyle, but they also compliment your wedding dress. Of course there are veils for every look. 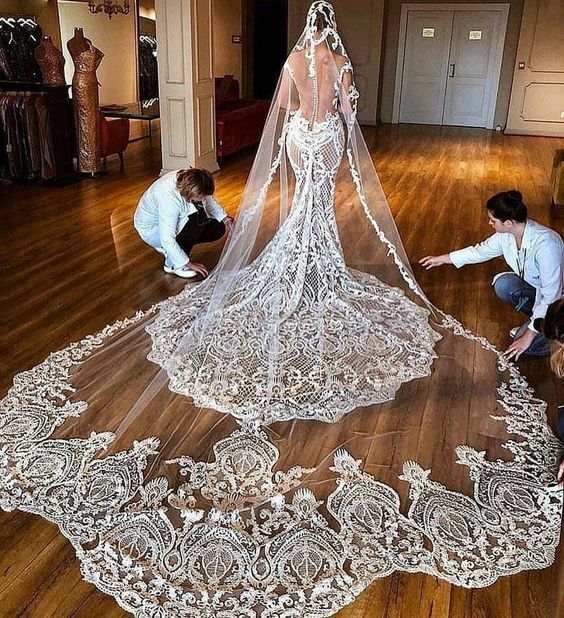 For example, you may be wearing a large ballroom wedding gown, you may want to consider a veil with a very long train. On the other hand, if you’re wearing a mermaid gown with shoulder straps you may want a shorter veil. There are so many options to choose from, and we’re going to show you some beautiful custom wedding veils to spark your inspiration! 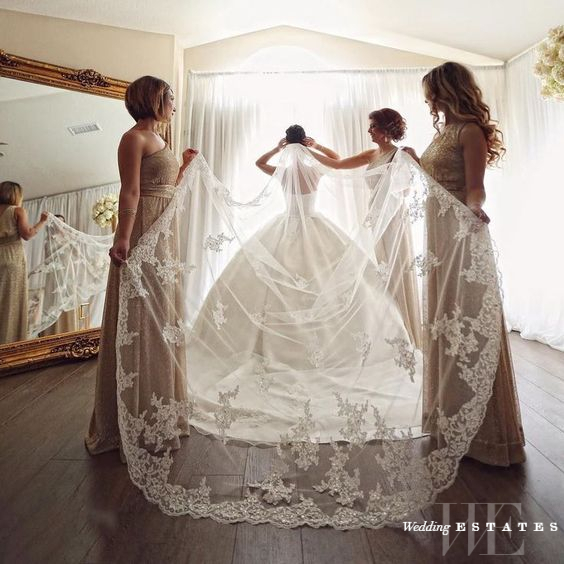 This custom wedding dress is the perfect example of how perfect your veil will bring together your wedding look. 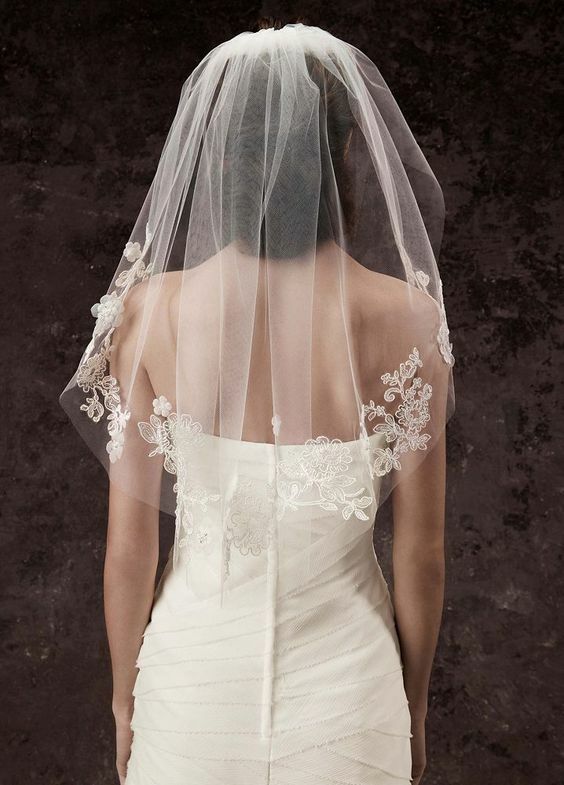 Not only does this veil have the same lace pattern on it, but it’s also very light and sheer. Another feature, her veil doesn’t have a face cover. Often times, not every brides wants a face cover. We’ve seen this more and more with modern brides. 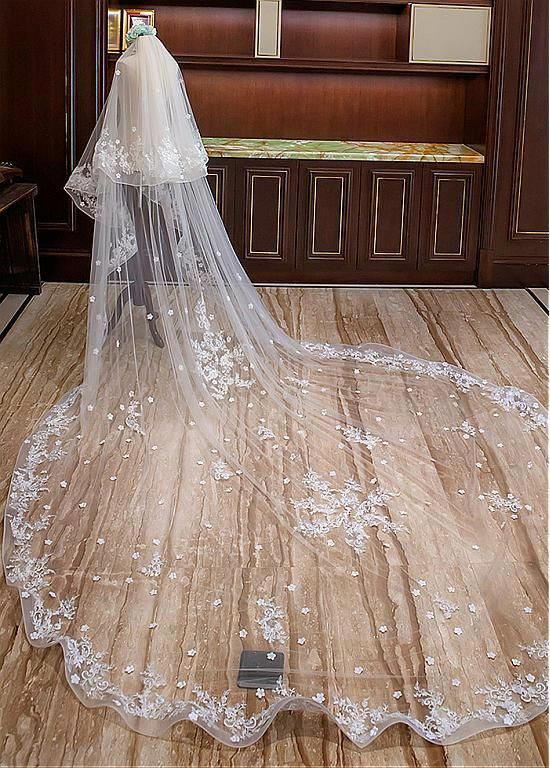 This is a mermaid gown with a train, as well as a long lace veil with a train. Isn’t this a beautiful combination? 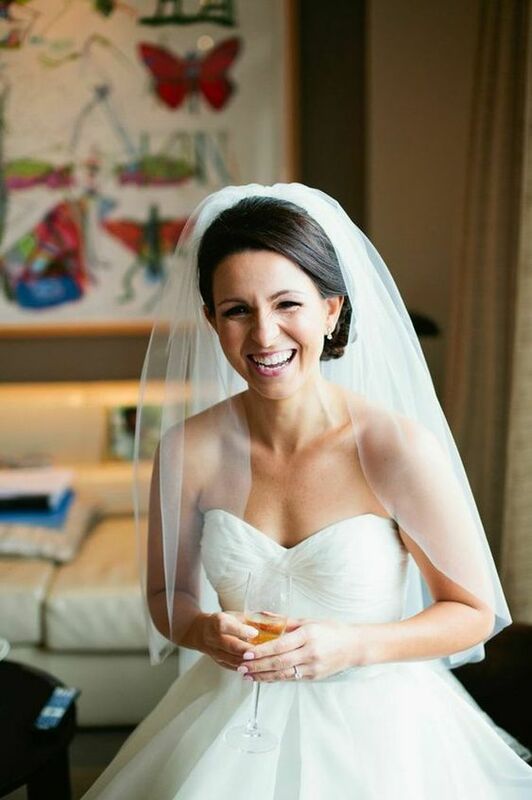 The short veil, also know as a blusher is a very short veil that covers just the bride’s face as she enters the ceremony. 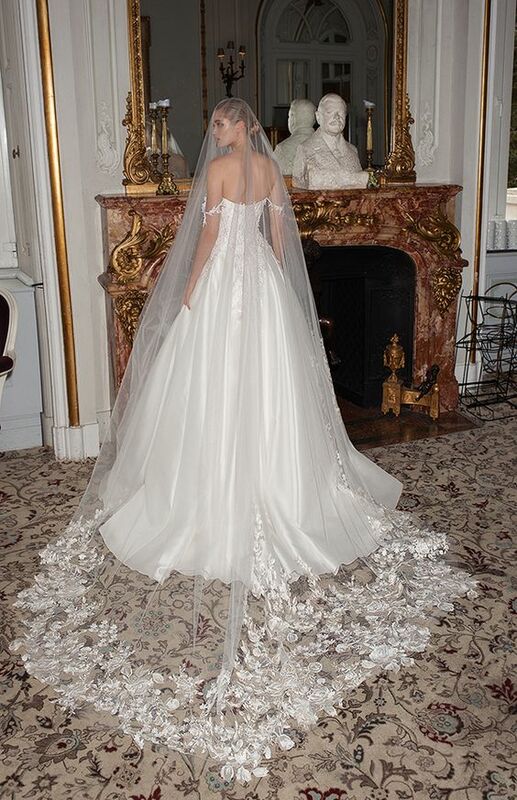 With a fingertip veil, the veil reaches the bride’s waist and brushes at her fingertips. These veils are simple and pretty for brides that don’t want to worry about having to carry their veil around all night. It’s also a traditional look that modern brides rarely wear anymore. Niagara – Two Tier Couture Bridal Veil with 2 horsehair edging. A medium length veil is the perfect way to get the best of both worlds. You can customize it with lace and beads if you like of keep it simple and light. This veil gives you length and ease. 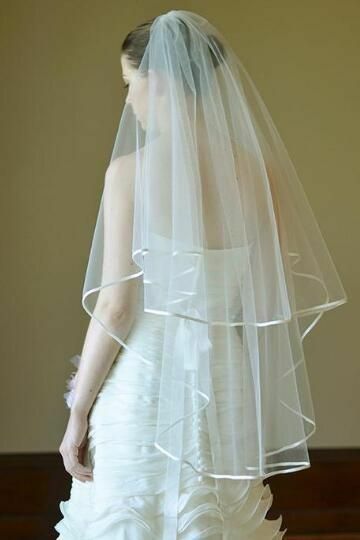 This elegant veil made from soft tulle. Available in White, Ivory, Blush, Pink or Champagne shades. 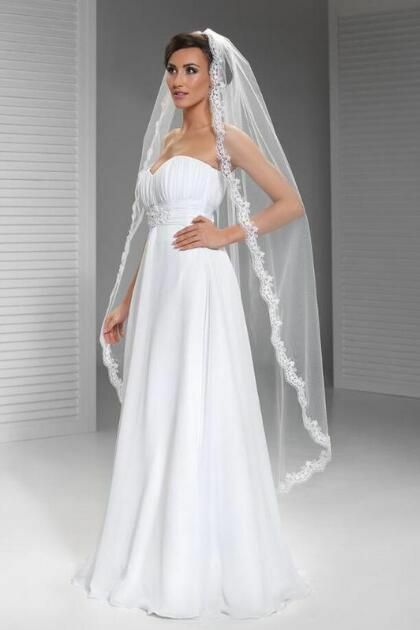 This veil fall somewhere in-between, waist length and fingertip length. Since this veil comes with the comb the length will depend not only on your height, but also on where, on your head you place comb. If you wear your veil forward, towards the front of your head, it will look shorter. A great way to match your veil with your dress is to try a lot of options. Take your best friend with you and make a day of it. Also see our other blogs for hair and makeup inspiration to find out what other brides are doing for their wedding day!